Dr. Deepak Chopra is a leader in the field of mind-body medicine. He created the Chopra Center for Well Being in California in 1995 and serves as its director of education. The Center, which offers training programs in mind-body medicine, is a vehicle for expanding his healing approach and integrating the best of western medicine with natural healing traditions. Dr. Chopra is the former chief of staff at Boston Regional Medical Center and built a successful endocrinology practice in the 1980s. He realized that perfect health is more than just the absence of disease. He has discovered practical skills to ensure perfect health and total well-being that enable people to take control of their lives. In 1992, he served on the National Institutes of Health Ad Hoc Panel on Alternative Medicine. Dr. Chopra is the author of more than 35 books, including The Seven Spiritual Laws of Success, and over 100 audio, video, and CD-ROM titles. He has sold more than 20 million copies of his books worldwide. Dr. Chopra is a fellow of the American College of Physicians and a member of the American Association of Clinical Endocrinologists. 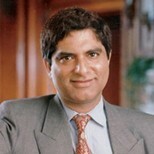 Dr. Chopra is an international presenter and keynote speaker. Esquire magazine named him as one of the top ten motivational speakers in the country, and in 1995, he joined four others as recipients of the Toastmasters International Top Five Outstanding Speakers award. Dr. Chopra has been a keynote speaker at several academic institutions. • If you and I are having a single thought of violence or hatred against anyone in the world at this moment, we are contributing to the wounding of the world. • Most people think that aging is irreversible and we know that there are mechanisms even in the human machinery that allow for the reversal of aging, through correction of diet, through antioxidants, through removal of toxins from the body, through exercise, through yoga and breathing techniques, and through meditation. • The physical world, including our bodies, is a response of the observer. We create our bodies as we create the experience of our world. • The way you think, the way you behave, the way you eat, can influence your life by 30 to 50 years. • There is always one moment in childhood when the door opens and lets the future in. • We are not victims of aging, sickness, and death. These are part of scenery, not the seer, who is immune to any form of change. This seer is the spirit, the expression of eternal being. • You and I are essentially infinite choice-makers. In every moment of our existence, we are in that field of all possibilities where we have access to an infinity of choices. • You believe that you live in the world, when in fact the world lives within you. • Perfect health, pure and invincible, is the state we have lost. Regain it, and we regain a world. • From a pure heart anything can be accomplished. If you ask what the universe is doing, it is eavesdropping on your every desire. • Silence is the great teacher, and to learn its lessons you must pay attention to it. There is no substitute for the creative inspiration, knowledge, and stability that come from knowing how to contact your core of inner silence. • The possibility of stepping into a higher plane is quite real for everyone. It requires no force or effort or sacrifice. It involves little more than changing our ideas about what is normal. • In the midst of movement and chaos, keep stillness inside of you. Deepak Chopra has contributed considerably to teaching us about spiritual growth, the mind-body connection, and healing. His impact makes it difficult to decide how to get started. His seminars probably have the greatest impact, his books contain the greatest details, and his audio programs provide a quick, easy way to get a sense of what Dr. Chopra has to say. Dr. Chopra has a soothing, reassuring voice that instills a sense of well-being in the listener. With all of the information that he provides, I would suggest starting with the The Seven Spiritual Laws of Success, in either book or audio form. In it, he discusses natural laws which govern all of creation. Dr. Chopra teaches us that after we understand our true nature and learn to live in harmony with natural law, we can develop a better sense of good health and improved relationships. We can gain an increased energy and enthusiasm for life. These benefits will then lead us to greater material abundance. • Listen with your heart. • Evaluate consequences of your choices. • Take responsibility for actions, not blaming others/things. • Give something to everyone you meet (i.e.—a compliment, a silent blessing, a gift). • Be open to receive from others. • Commune with nature—appreciate the beauty. Deepak Chopra has a unique spiritual quality and a tremendous ability to teach and communicate this spirituality to others.